There was a time when developments in the realm of amateur radio were relevant in relation to the rest of the world. In those days, a young man might become interested in the technology of radio and his first steps in that venture may have been as a radio amateur. Through building and experimentation this neophyte might eventually make a living as a radio and TV repairman, or find work as an electronics technician. He might even follow a path to becoming an electronics engineer developing new methods and hardware for commercial or military communication. There was a thread of commonality between his hobby and his vocation. Radio amateurs were on the leading edge of discovery and experimentation and these developments were closely mirrored in the non-amateur world. In fact, what this fellow was doing on the workbench in his ham shack was often a step or two ahead of what he did for his employer. But at some point in the flow of space and time, amateur radio reached a critical crossroad. It could proceed one direction into the future or choose the other direction – a long, and circuitous route back to the past. For good or for bad, we chose to jettison the future and return to the past. Consider carefully the position of amateur radio just prior to this crossroad. We had pioneered FM radio at VHF and UHF and had blanketed the countryside with repeaters such that an operator with a handheld radio could make contact with others far outside his line of site. We had already worked out the protocols and network topology necessary for passing data through the ether at rates comparable to landline methods of the age. And we had our own fleet of satellites that pioneered new methods in space communication as well as low-cost spacecraft construction and launch. 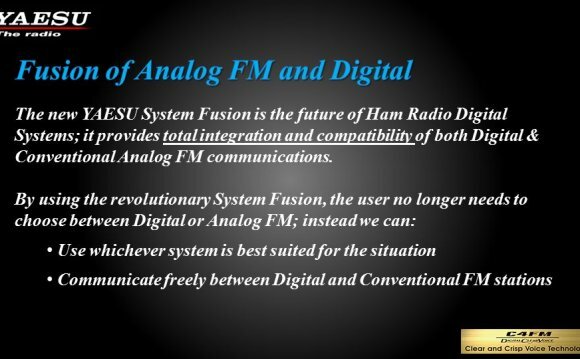 Future developments in the non-amateur world of radio from that point included cellular technology and the transmission of higher speed data over the air. Commercial applications for broadcast radio and television have changed radically and now include the imposition of digital methods. Military applications for secure battlefield communication use satellite and terrestrial means like mesh networking for voice and data transmission. Our homes, restaurants and coffee shops are bathed in RF transmitted data that keep our mobile devices connected to the Internet. None of these “new” technologies would have been even the least bit foreign to the radio amateur had we taken the path to the future. Youngsters would have been encouraged to become involved in our hobby as it could very well lead to a rewarding career in one of many growing and lucrative technical fields – just like in the earlier days. The most important point I want to make is this: technology didn’t pass amateur radio by because we weren’t intelligent enough to have adapted to the rapid changes it produced, we could have lead that revolution, ham radio enthusiasts were the proto-geeks on this planet. No, technology didn’t abandon us, rather, we voluntarily chose a path that led back to the past and in so doing, watched the future march ahead without us. My guess is that we chose this path because the future involved changes that seriously challenged the old dogmas. The old guy who could pound brass would be dimininshed in the new world while the young kid with the computer connected to his radio would be raised up and this was deemed unacceptable. Of course there remain some facets of our hobby where higher tech methods are required. For instance, it would be difficult to argue that bouncing a radio signal off the moon and then receiving the echo from it isn’t one of the more challenging things that hams do. But consider how many amateurs are active in that pursuit and you must conclude that it’s a small fraction of even one percent of all licensees. Why? Probably because of the degree of technical difficulty required for success. It’s much easier, trivial in fact, to toss a wire over a tree limb and make a 40 meter CW contact; so more choose to do that instead. Low-power enthusiasts, (QRP) have spent decades trying to make the point that HF communication is possible with practically nothing at all. That you or I could whip up a two-transistor transceiver in a single evening and make radio contacts with it is widely seen as the magic of radio among those in this camp, however, it really only serves to make the point that they have embraced the simplest, lowest elements of RF technology and have no intention of moving beyond it. In selecting the path to the past, we also decided that the entertainment value of amateur radio was more important than the rapidly expanding field of communication technology. Consider the many ways that we have made two-way radio a game. We chase DX until all of the countries of the world have been worked and then we invent new ones. Weekends are dedicated to non-stop operation with the goal being to earn the most points. We make radio contact with others and then trade post cards to prove that we actually did it. Certificates (wallpaper) of all kinds are offered for contact with specific stations or during specific events, etc. The lingua franca of amateur radio is the Morse code and those who are proficient in CW are more valued than those who are not. Like Latin, it’s a dead language that is non-essential yet it serves as a powerful totem for an entire belief system internal to amateur radio and nothing else under the sun. In selecting the path to the past, the hobby has determined that nostalgia is more important than innovation and therefore we must now depend upon nostalgia to drive future growth; this is a critical point. The United States has a population with a soon coming glut (baby boomers) of new retirees. Folks like me who enjoy looking at the past as much or more than looking ahead. This is a ready-built market for nostalgic growth and we should anticipate that those who enjoy reading about the radio distress call from the Titanic, restoring old radios or building new equipment with vacuum tubes, etc. will swell our numbers for a season. It’s completely unsustainable over the longer-term, but it is here and now and it will contribute to some additional growth for the hobby. Though ham radio is a delightful and enjoyable hobby, we are forced to own up to the consequences of the decision that was made not so long ago. Ham radio has become like an old trading post on a lonely stretch of Route 66 somewhere in the desert. You stop to admire the wooden Indian, the old time gas pumps and the soda machines. You snap a few pictures, buy a few trinkets for your niece and nephew and spend a moment warmly remembering what the Old West was like long ago. Ham Radio was a monthly amateur radio enthusiast magazine published in the United States from February 1968 to June 1990. The magazine was published in English and drew its subscription base primarily from the United States of America and Canada.